Ask just about anyone and they’ll tell you to “socialise” your puppy.” But what does that mean? Socialisation is a deceptively simple concept and it means different things to different folks. Plus, some of the ‘socialisation classes’ out there often end up creating the very problems they aimed to prevent. What Makes A Good (or bad!) Socialisation Class? Beware classes where puppies are encouraged to simply make a beeline for other dogs, romp till they drop … and ignore their owner. Err, why would you want that?! Surely, you want your puppy to be calm around other dogs (or humans) and ensure your pup can respond to you amid distractions? “Over friendliness” is a nice term for a common problem. Dogs who think that every other dog/human equals playtime can be very annoying! You may have met such a dog, you know the one who simply cant settle until he’s dragged the owner across a field barking or whining to ‘say hello’ to another dog? Do your pup a favour – practice ignoring other dogs (and people!) as often as you practise politely greeting them. This may sound odd but imagine someone walking down the street who approached every stranger he happened upon. It’d be weird … possibly creepy! Teaching your pup how to ignore other beings at certain times doesn’t make your pup less social or civilised, it just means your pup learns when its appropriate to greet and when it’s not. Plus it makes Fido a more pleasant companion! The ‘play fighting’ that is sometimes allowed in ‘socialisation classes’ is far from social. 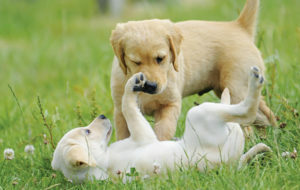 It’s called ‘play fighting’ for a reason – it’s practising fighting! 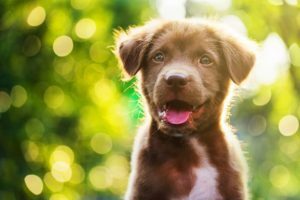 Why would you want your puppy practising behaviours that may be unacceptable as he or she grows up or that may provoke an aggressive or anxious reaction from other dogs? Encouraging over boisterous ‘play’ simply lays down a blue print in your little pup’s brain of what is ‘ok’; but this kind of behaviour isn’t ok. So help your puppy out; teach your puppy how to interact politely and help them develop an ‘on/off’ switch so they can leave an interaction if required. And that hyper wiggly thing where the puppy rolls on its back when approached? Is that ‘social’ or is it actually the puppy being anxious or overwhelmed by the situation? Often the frenetic wiggling and roll on the back is an appeasement gesture. Its the puppy’s way of saying ‘I’m not sure how to handle this’. By contrast, a pup with sound social skills doesn’t need to get all hyped up; he or she has the confidence to approach calmly and ‘read’ the situation rather than ‘react’ to it. Beware classes with lots of puppies (more than 6 or 8); it’s too much even for a highly skilled Trainer to manage properly.  And think about the size of the room – you and your pup should have enough space from your classmates that your puppy can focus on you when you ask. If your pup cant do this and is constantly lunging towards the puppy next to you – you’re too close. And maybe the room is just too crowded for effective learning. Teach your pup how to approach lots of different social situations … calmly. Teach your pup how to ‘tune-out distractions’ and walk on by. Dogs who learn these skills, learn to ‘think’ rather than ‘react emotionally’ – and this gives them an advantage in life. By contrast, a dog who never learned who to greet calmly may end up meeting fewer dogs/people because he or she ‘cant be trusted’. This makes outings stressful and limits your dog’s (and your own) social experiences. And if you’d like help training your puppy to be just that, contact Joyful Dogs or enroll on one of our Puppy School courses.